A new 30 watt output transformer with a 4200 ohm primary and 4 & 8 ohm output taps and screen taps at 40% of the primary for added versatility. Based on, same size and interchangeable with the output transformer used in the Fender Bandmaster and Vibrolux amplifiers. May be used as a replacement for Fender p/n 22848 in Pro Reverb, Tremolux, Vibrolux, Bandmaster, and Vibroverb, and adds extra versatility in speaker output connections due to the additional 8 ohm speaker tap. This transformer can also be used to replace blown outputs on many low & mid-priced tube hi-fis, stereos, and console radios, as well as some jukeboxes from the 40's, 50's & 60's. This type of transformer can be used with many tube types, such as pairs of 807, 6L6, KT66, EL34, push-pull parallel (quads) of 6V6's or EL84 and others. Intended for push-pull use. 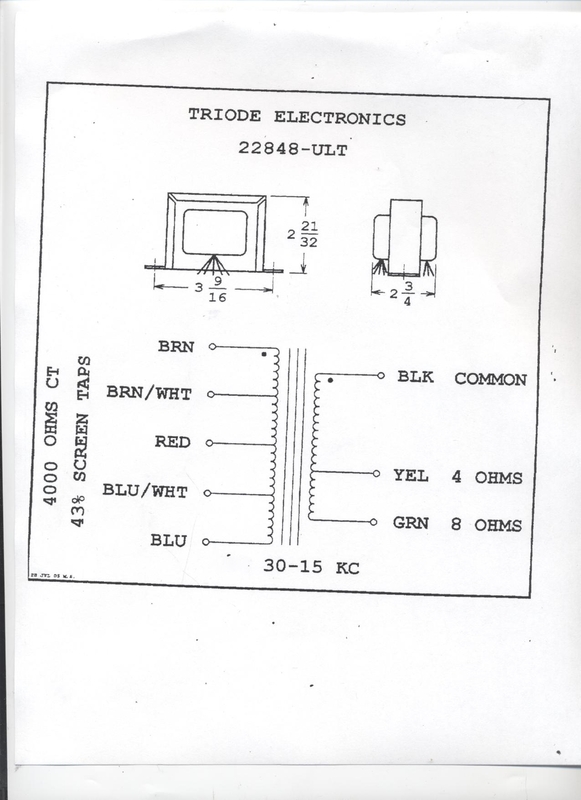 May be used with tubes wired for pentode, triode, or "ultralinear" pseudo-triode operation. Nice size unit, weighs 2 1/2 lbs (1 kg). Screen taps may be used or taped up & ignored if you don't want to use them. Max DC per side (suggested) 100 ma. Height 2 1/2 inches (65 mm) width 3 inches (78 mm), depth over cover 2 3/4 inches (72 mm), bolt mounting centers are 3 1/2 inches (90 mm) apart. Primary impedance is 4200 ohms with screen taps @ 40%, secondary is 0-4-8 ohms. Rated 35W 50Hz to 20KHz -1 db.